In an age when it was dangerous to be posh and deadly to be critical of the Party, Bulgakov, in his monocle and tux, dared to be both. His writing is always clever, funny, bizarre, and political. Here, an erudite professor accidentally creates his worst nightmare: the archetypal Soviet man. 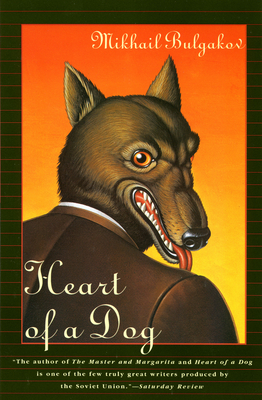 Master and Margarita may be Bulgakov's most popular work, but this novella is my all-time favorite. I first read Mikhail Bulgakov's The Master and Margarita on a balcony of the Hotel Metropole in Saigon on three summer evenings in 1971. The tropical air was heavy and full of the smells of cordite and motorcycle exhaust and rotting fish and wood-fire stoves, and the horizon flared ambiguously, perhaps from heat lightning, perhaps from bombs. Later each night, as was my custom, I would wander out into the steamy back alleys of the city, where no one ever seemed to sleep, and crouch in doorways with the people and listen to the stories of their culture and their ancestors and their ongoing lives. Bulgakov taught me to hear something in those stories that I had not yet clearly heard. One could call it, in terms that would soon thereafter gain wide currency, "magical realism." The deadpan mix of the fantastic and the realistic was at the heart of the Vietnamese mythos. It is at the heart of the present zeitgeist. And it was not invented by Gabriel Garcia Marquez, as wonderful as his One Hundred Years of Solitude is. Garcia Marquez's landmark work of magical realism was predated by nearly three decades by Bulgakov's brilliant masterpiece of a novel. That summer in Saigon a vodka-swilling, talking black cat, a coven of beautiful naked witches, Pontius Pilate, and a whole cast of benighted writers of Stalinist Moscow and Satan himself all took up permanent residence in my creative unconscious. Their presence, perhaps more than anything else from the realm of literature, has helped shape the work I am most proud of. I'm often asked for a list of favorite authors. Here is my advice. Read Bulgakov. Look around you at the new century. He will show you things you need to see.